Here's something I wasn't expecting when I recently started reading comics: there is no "everyday" in comics anymore. Looking at any Previews catalog and the descriptions of comics always take the form of "can so-and-so save the universe?" Words and phrases like "shocking" and "devastation," and "new era," and "threatens the existence of everything!" seem to get thrown around a lot, and that's just looking at the description of a few books. Before I started reading comics I thought Batman ran around and collared Arkham escapees, and Superman saved Lois Lane and cats stuck in trees. Little did I know comics were laden with so many universe-threatening events on a constant basis. This isn't to say those big crossover events are bad because they're big, I'm just saying there needs to be a few average days in Gotham or Metropolis to balance things out. Why? Well, let's digress with a True Story From My Childhood. When I was twelve I read Jurassic Park when it first came out, and then saw it in the theater shortly thereafter. Now, from the time I was seven and wanted to be a paleantologist, I loved dinosaurs, and I loved the movie. Even more than the movie I loved John Williams's score to Jurassic Park, and if you don't know who John Williams is, if you know the themes to Star Wars, Superman, Indiana Jones, Jaws, and E.T., then you've heard his work. Shortly after seeing the movie, I convinced my piano teacher to order the sheet music for Jurassic Park for me, even though it was above my level, and commenced to burn through that score like there was no tomorrow. Except for the quiet intro, I played that thing at full tilt, loud all the way through, because it was a blast to play and it sounded good really loud. One day my teacher stopped me when I was about to get to the crescendo and said, "Hold on. You've got to play it more quietly there." "But it's marked forte," I argued. Forte means loud! Loud loud loud! And it was fun to play LOUD! "Yes," she said, "but you've got to quiet down just a little bit, otherwise you can't get loudER. There's nothing to build towards." "Oh." Well, a dim bulb brightened. What's the point of the loud sections if you can't contrast it with semi-loud, or less-loud, or not-quite-loud? So, when it comes to comics, if all the heroes constantly deal with is world-ending crises, or traumatic events that shake a character to his core and bring him in a "shocking new direction," well, it gets monotonous. If there aren't some "smaller" stories out there to contrast the big ones, well, the big ones lose their punch, becuase if multiple Earths keep crashing into each other on a daily basis it doesn't become a crisis anymore, just Tuesday. Not to mention the old writing maxim "don't write a story about Man. Write a story about a man." Giant, mind-blowing huge ensemble stories lack some punch because they are so epic, and therefore general, in scale. There's never a chance to get to really know anyone or follow a single character arc. (Though Blackest Night is and exception and did a pretty good job in its characterization.) Stories which are smaller in scope have the benefit of allowing us to see how a character thinks, works, and who he or she truly is. Smaller stories, counterintuitively, allow for more latitude in character choice than the big ones do. Obviously if the world is ending or millions of zombies are coming back to life, there is no choice BUT to choose to save the world. If you choose not to save the world, you're a jerk, and probably not a hero. But a smaller story has the luxury of allowing the characters to seek different options and different directions while arriving at the endpoint of justice. Should Barbara Gordon help Stephanie Brown become the next Batgirl or not? Will Helena Bertinelli choose justice or revenge? And so on. A character's choices reveal the true essence of a character, and these choices are what the reader identifies with. This is why so many characters are needlessly killed off during world-ending "crisis" stories. Since the only moral choice in a world-ending crisis story is "to save the world," there is no room for smaller, character-illuminating choices or character centric story arcs. Therefore, the only way to engender audience empathy is to kill off a character. It's an easy route to audience sympathy in lieu of other means of characterization. Yes, there may be choices involved in saving the world (do we contact the Indigo Tribe?, etc. ), but they often have little to do with characterization and merely serve to move the plot forward. I love how stretchy the cat's tail is. In the right hands, even the smallest of stories can be entertaining, amusing, or dramatic. 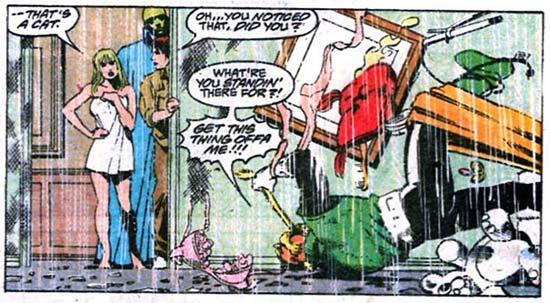 One of my favorite Justice League International stories is JLI #37, in which the entire plot pretty much hinges on a feral cat wandering into the JLI Embassy and causing all sorts of trouble. It's an issue I love to read and re-read, not only becuase it's hilarious, but because each character is so well-defined that you can easily figure out who's talking, even through lengthy off-panel conversations. It's a small story, yes, but that only makes it that much better. Let's have a few more nice, quiet stories to give us a breather in between all the world-saving, shall we? With a little more quiet "normalcy," those big crossovers will be true crescendos. To people who write stories for a living, including comic book writers, what you said is common sense. But so long as comics readers are conned into believing that every mini-series that "changes the universe as we know it," and all of the cross-over issues connected to that mini-series, are required reading -- so long as you and every other fan keep buying this crap -- comics publishers will keep publishing it. Blackest Night will be followed by Blackest Day, which will lead to the next Big Event, and so on, and your heroes will never have a moment's peace. Never mind that a couple of years from now nothing in Blackest Night will matter. When was the last time a DC comic refered to the "universe-changing events" in Legends, Armageddon 2001 or DC One Million? When I read the first sentence of this post I immediately thought cat story in JLI! A lot of the JLI run did the everyday really well I think. I'd really love to see a storyline where a hero compalins that the so-called super-earth shattering crisis was not at all super-earth shattering. It would be sort of a "Call me when things really get cosmic" tell-off story where said hero just goes home to water his plants and play with his pet for the last 18 pages. Tom, wait, what--are you implying the comics industry is conning us into buying books that we really don't need? Perish the thought! 1TrueGl, at this point I need such a breather that I'll read a comic book where a character does nothing but read the phone book for 22 pages. Or mow the lawn. Or take out the trash. Blue and Gold wash the dishes! 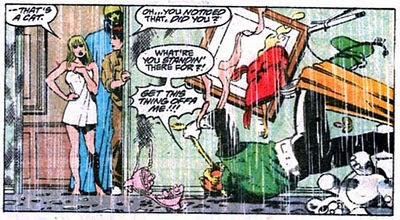 J'onn dusts the Watchtower trophy room! The Question goes through people's trash!